The islands of Maui leap from the sea within sight of each other, seemingly alike when viewed from a distance, but with individual spirits when seen up close: busy, active Maui itself; quiet, outdoorsy Läna i; understated, Hawaiian Moloka i; and on the horizon, Kaho olawe, an ancient island being transformed. This volume brings the islands of Maui to life. Its photos display the unimaginable colors of the sea and the land for those who visit as well as those fortunate enough to live here, revealing secrets most never see. 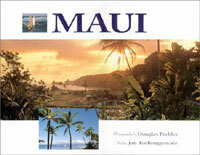 The islands of Maui are inextricably linked. They were once a single island, but their broad valleys were drowned by rising sea levels. Today, while they share a common botanical and geological heritage, each has a unique essence. Master photographer Doug Peebles has ranged through Maui County, taking to the air and the sea to capture images that tell an entrancing story of the islands places. Writer Jan TenBruggencate was raised on Moloka i and has walked the highways and the dusty paths of each of the four islands. Their collaboration springs out of these pages, alive and vibrant.